Dash is an offline Documentation browser, that allows you to download and view over 150 documentation sets of various programming languages. Because of it I can view documentation offline whenever I need to quickly reference or check a function and all it takes is just 2 seconds because of Dash's powerful search that instantly displays the search results. 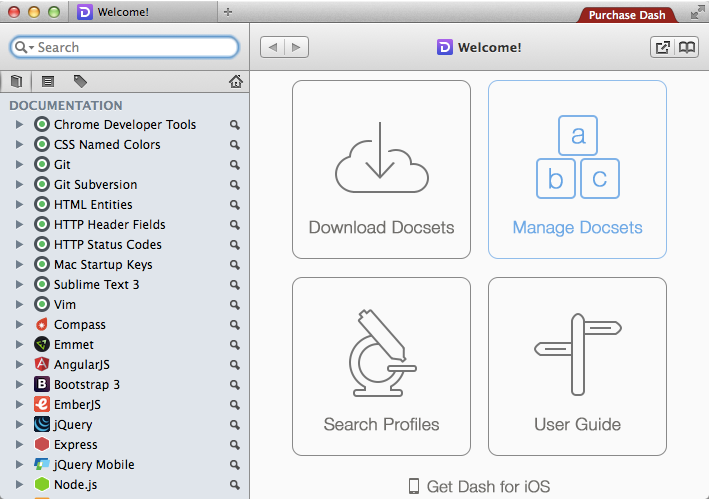 Dash is a free software for Mac and iOS that can be downloaded through Dash Homepage. Dash also integrates with other softwares that makes using Dash with your already existing softwares extremely easy, such as Sublime Text, Alfred, Coda, Xcode, Brackets and Many More. you can also use Dash API in your own custom software you created. Free version of Dash sometime has a waiting time of 8 seconds before viewing the documentation page, but that is a small tradeoff for the powerful features it gives, so if you like and want to, you can even buy the premium version. but the premium version and free version do not have any difference except the waiting time, so it is completely upto you to support the developer for creating such a wonderful software. I have been using Dash for almost 6 months but as you already know Dash is Mac and iOS exclusively only. but there is another Offline Documentation browser for Windows and Linux that has been Inspired by Dash.